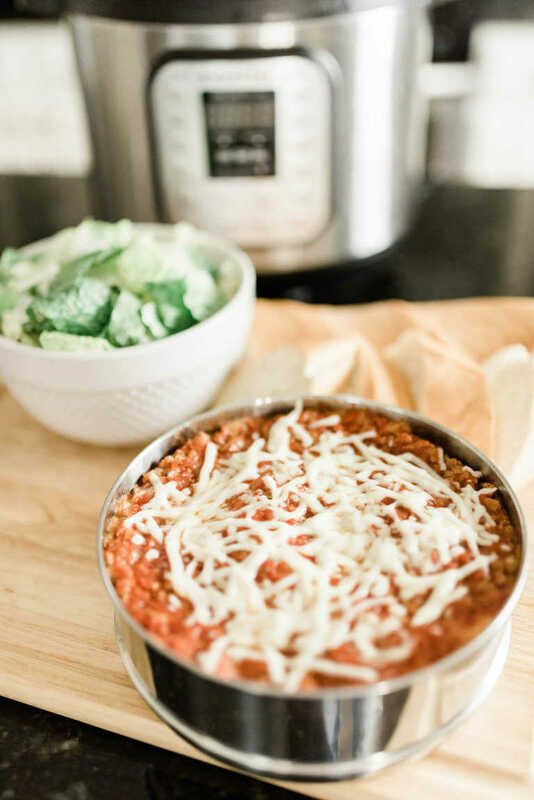 Lasagna can easily become a weeknight meal with this Instant Pot Lasagna recipe! All the comfort of a cheesy, delicious lasagna without all the stress and time of a traditional lasagna recipe! 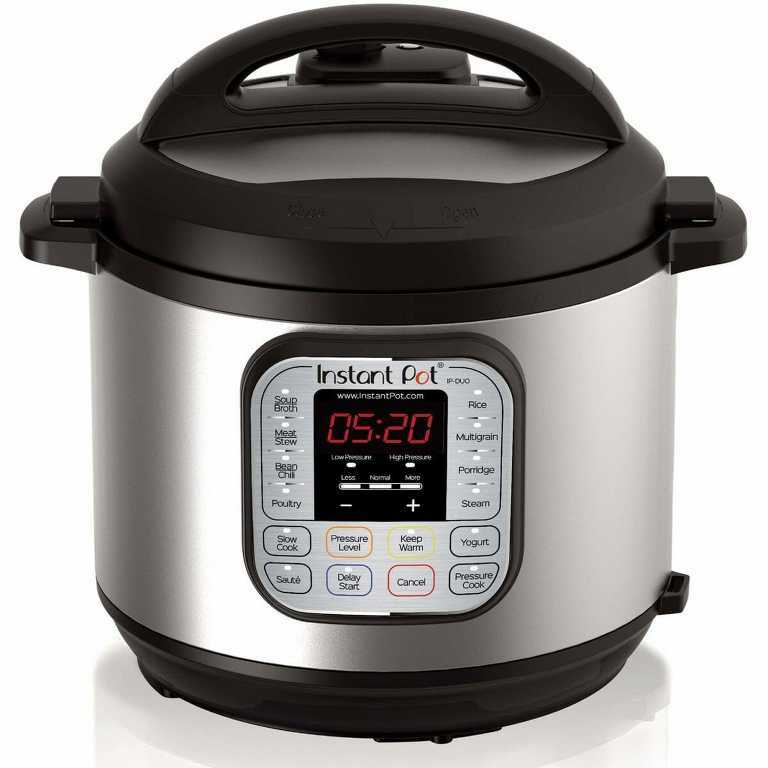 This instant pot recipe is done in under a half an hour! Lasagna is one of my husband’s favorite meals! For years I have been using this Crockpot Lasagna recipe, but recently I decided I wanted to try it in the instant pot to see if it would turn out just as well with a fraction of the time. 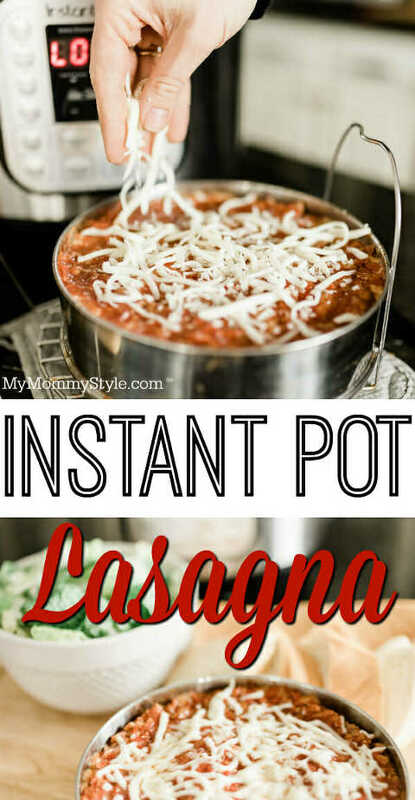 It is best if you have an insert to put within your instant pot to make cleanup as easy as possible, but it is not necessary to make the lasagna. You can find these inserts on Amazon here. They can be used to cook your main course and vegetables at the same time, a lasagna/casserole, or even a cake! Layer a bit of sauce/meat mixture. I finished with the sauce layer and added the final layer of cheese later, you are welcome to add the final layer of cheese on top before you cook it in the pressure cooker. Cover with lid. If you are using a spring form pan you can use a piece of sprayed foil. Set on a trivet with handles (or use a sling) and put it in the instant pot. Seal the instant pot lid with button on seal and allow pot to pressurize. Set for 24 minutes on manual high. Allow pot to natural release for 10-15 minutes. Release the remaining pressure by switching the button on the top of the pot and allowing the rest of the air to come out. When the pressure has all been released remove the lid and use hot pads to pull the trivet out with the pot. Be careful not to burn yourself! Add a sprinkle of cheese on the top, using a bowl upside down set it over the pan to allow cheese to melt. Enjoy a lovely lasagna in your instant pot that can be ready in under thirty minutes. Cook meat, onion, and garlic together in saucepan until browned. Drain. Stir in tomato sauce, water, salt, and oregano into saucepan. Mix well. Spray cooking pan or spring pan with non-stick cooking spray. Spread one fourth of meat sauce. Arrange one third of noodles over sauce. You will have to break noodles to fit into Crock Pot. Combine the cheeses & spoon one third of mixture over noodles. Cover with lid or sprayed tin foil if you are using a spring pan. Place pan inside pot resting on a trivet. Cook on Manual high pressure for 24 minutes. Allow to naturally release for 10 minutes. Release pressure and let it slowly release the extra pressure. Use hot mitts to remove pan using the handles of the trivet. Add a layer of cheese on the top, I used a bowl and flipped it upside down over the pan to melt the cheese. It took a couple of minutes. Note: if you do not have all of the ingredients you need to make the marinara sauce you can simply replace step two with pouring in your favorite marinara sauce. It would probably take an entire jar. This recipe can a lot of times taste better the next day heated up in the microwave. It may be best to turn off the heat and let the juices settle 15-20 minutes before serving. ENJOY! This recipe can also be made in the crockpot! You can follow the instructions for that below!